We love Orangutan so much! We want to hug them like a doll, want to touch, want to hold them and even want to preserve them. But do you know that the interaction between humans and orangutans are a dangerous thing? Researchers from the Faculty of parasitology orangutan R Wishnu Nurcahyo stated, studies initiated since 1999 has found a wide variety of parasites in orangutans. This time, he continued with the team is concentrating on researching malaria of orangutan suspected Plasmodium knowlesi species that can be transmitted to humans (zoo noses). Malaria and other parasitic diseases cause a decline in the population of primates. Because of the orangutan is very easy for a disease that is similar to humans, so some infectious diseases in humans can be suffered by orangutans such as contagious disease Tuberculosis, Hepatitis, Typhoid, bacteria, viruses, and respiratory tract infections. Various diseases, he added, often attacking the orangutan. 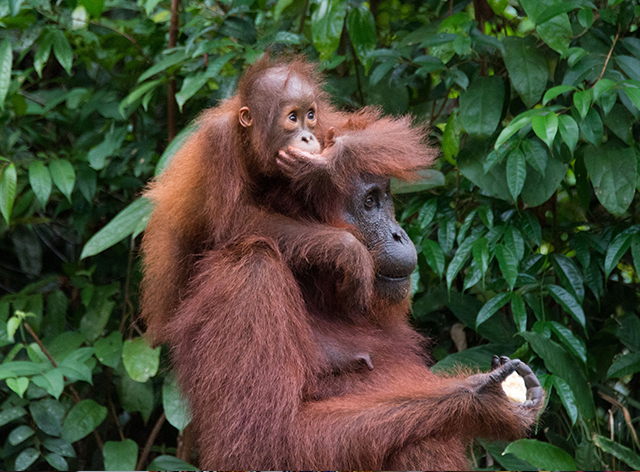 Especially for orangutans have long maintained or contact with humans. So that when released into the area to interact within the larger population, then become carriers of the disease to others. Therefore, for survival together, usually tourists are forbidden to touch the orangutans at all. Unless, someone who wants to observe them under control by NGOs of Orangutan along with licenses who want to direct interaction obligate for medical check-up dangerous diseases among HIV AIDS, TB, Hepatitis, Herpes, Typhoid, and dengue. After that, it is also still required to wear a mask when someone meets orangutan. So, give and send them a love without to touch them. We can still be given the opportunity to be able to love them through Orangutan adoption program through BOS (Borneo Orangutan Survival).